DURHAM, N.C. (AP) Grayson Allen scored 16 points and No. 1 Duke opened its season by routing Marist 94-49 on Friday night. Freshman Frank Jackson had 18 points in his debut with the Blue Devils while Luke Kennard added 16 points. Duke shot 44 percent and had an easy time against the Red Foxes despite playing without three big men from a freshman class widely considered the nation's best. Chase Jeter finished with 11 points in his first career start and Matt Jones also had 11 for Duke, which pushed its lead into double figures for good before Marist managed its first defensive stop. Khallid Hart had 13 points to lead Marist, which was just 3 of 25 from 3-point range. Injuries in the preseason have left the Blue Devils short in the paint: Forward Jayson Tatum missed both exhibition games after spraining his foot during a practice last month, center Marques Bolden earlier this week was declared out of both games this weekend with a leg injury, and forward Harry Giles is recovering after having his left knee scoped in October to clean up some loose bodies and scar tissue. Duke held a 56-33 rebounding edge against an outmanned Marist team that didn't have anyone taller than 6-foot-9 on the roster. The Red Foxes had no answers for Allen – the ACC's preseason player of the year and an AP preseason All-America – and Kennard – who continued his productive play after averaging 23.5 points in two exhibitions. 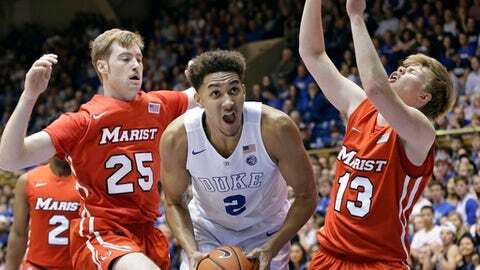 Marist: The Red Foxes met a similar fate as the previous 125 nonconference teams to visit Cameron Indoor Stadium. No shame in losing like this to Duke because the nation's No. 1 team is hardly a fair measuring stick for a young team that went 7-23 last season. Duke: Jeter looked significantly more confident during his first start than he did at virtually any point during an uneven freshman season. With so many big men out, any production they can get from Jeter is a significant plus. Marist: The Red Foxes have a couple of travel days before taking on No. 23 Rhode Island on Monday night in the Hall of Fame Tip-Off Classic. Duke: The Blue Devils face a quick turnaround with Grand Canyon coming in Saturday afternoon. Consider it a final mid-major tuneup before taking on No. 3 Kansas next week in the Champions Classic. Follow Joedy McCreary at http://twitter.com/joedyap.